It seems unlikely that the timing of this seasonally appropriate novel is an accident. But even though Three Rivers Press is flogging Frankenstein’s Monster by Susan Heyboer O’Keefe as “the perfect Halloween read” and even though the book is, in fact, a sequel to Mary Shelley’s classic and original Frankenstein, Heyb oer O’Keefe’s novel is as much art as artifice: in many ways it’s a beautiful and stunningly original book. Picking up where Shelley’s story left off, the monster is struggling with his humanity (just like in the movies, right: he was always struggling with humanity). 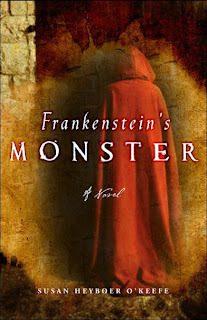 The monster is also looking for Captain Robert Walton, who overheard Doctor Frankenstein’s last words and vows to fulfill the dead man’s wishes. Told in the monster’s own humanly inhuman voice, it’s impossible at times not to feel both revulsion and sympathy. There is so much death in me I would not be surprised if a ghost had come to lay claim to my heart. Whose heart was it? I had none of my own. A thousand ghosts might haunt me, each one rightfully seeking its hand, its eye. Some unearthly darkness has crawled out of the night to haunt even my waking hours. I date not turn around to see. Where Are the Novels That Ooze Rococo? Future of Electronic Books: Web-Based?